According to a press release from Columbia Records, AC/DC’s latest offering ‘AC/DC Live At River Plate’ will receive its exclusive world premiere on Friday May 6, 2011 at London’s HMV Hammersmith Apollo. The DVD, shot entirely in HD with 32 cameras, will deliver to fans the experience of the thunderous excitement and intensity of the AC/DC live experience – all on the UK’s largest movie screen (roughly the equivalent of 4 double decker buses stacked). ‘AC/DC Live At River Plate’ chronicles the band’s massive Black Ice World Tour and the history of one of rock music’s best live acts. ‘AC/DC Live At River Plate’ will be available for purchase on Tuesday May 10, 2011. Shot in December 2009, ‘AC/DC Live At River Plate’ captures AC/DC’s triumphant return to Buenos Aires after a 13 year absence from Argentina. Directed by David Mallet and produced by Rocky Oldham, ‘AC/DC Live At River Plate’ features 19 songs (110 minutes) as well as behind the scenes footage and interviews with fans. 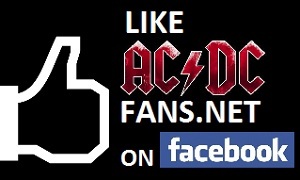 Read more AC/DC news and come join us in the AC/DC forum.